Orichalcos, spelled Oreichalcos (オレイカルコス Oreikarukosu) in the Japanese version, is a series of cards that revolves around "The Seal of Orichalcos" and are used by Dartz. It is currently an anime-only series, except for "Orichalcos Shunoros" (which had its effect changed to support Normal Monsters when it was released), and "The Seal of Orichalcos" itself (which kept part of its effects, but still went through changes), which was released in Legendary Collection 3: Yugi's World. It was very likely inspired by the fabled Atlantean metal Orichalcum. So far, "Orichalcos Shunoros" and "The Seal of Orichalcos" have a OCG/TCG equivalent released in Limited Edition 15 and Extra Pack 2012, respectively. Since "The Seal of Orichalcos" was not originally a legal card, "Orichalcos Shunoros" was retooled as a Normal Monster support card. In the anime, the text on all Orichalcos cards is written entirely in Enochian runes, except for "Orichalcos Sword of Sealing" (the only Orichalcos card that Dartz did not use). Orichalcos cards are focused on half-stall, half-Beatdown tactics by limiting the opponent's offensive tactics while building Life Points and an army of monsters. "Kyutora" is Summoned in the Spell & Trap Card Zone to protect it from attacks while it negates Battle Damage that weaker monsters, like "Gigas" would take by constantly ramming. The related anime counterpart of "Divine Serpent Geh" has infinite ATK, but one that has a huge cost in attacking and a winner-take-all style condition: Once it is Summoned, the controller loses their hand and Life Points, but doesn't lose until it is removed from the field. "Orichalcos" (Ορείχαλκος), a Greek word, literally translates to mountain copper/metal, although some scholars believe that it refers to 'natural' brass. Consequently, in Greek "Orichalcos Deuteros" ("Ορείχαλκος Δεύτερος") means Second Brass and "Orichalcos Tritos" ("Ορείχαλκος Τρίτος") means Third Brass. 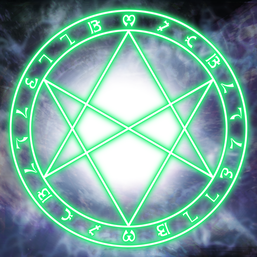 The Seal of Orichalcos is a unicursal hexagram inscribed in a circle. The unicursal hexagram was used by occultist Aleister Crowley as a symbol representing the religious philosophy of Thelema. This page was last edited on 14 March 2019, at 05:16.